Paris terror shootings updates: More than 100 dead. Police and rescue personnel in Paris’$2 10th arrondissement tonight. What we know right now: At least 120 people have been killed in terror attacks at multiple locations in Paris; Paris prosecutor François Molins said he believes five attackers may have been killed over the course of the night, while AFP reports the number as eight. No attackers have been reported to be at large. A number of mass shootings—the deadliest was at the Bataclan theater, where a rock concert was interrupted—took place near the center of Paris, while more than one explosion occurred near the Stade de France soccer stadium further north. France has announced it is tightening border controls and instituting extraordinary security measures in the Paris area. French President François Hollande said in a brief announcement that officials know who is responsible for the attacks but did not elaborate. Update, 10:55 p.m.: AFP reports that eight individuals died while carrying out the attacks; no attackers are believed to be at large. Update, 9:05 p.m.: The French government has amended its earlier statement that borders would be closed to say that tight border controls will be instituted but that a complete closure will not take place. Flights into France have reportedly continued as scheduled. 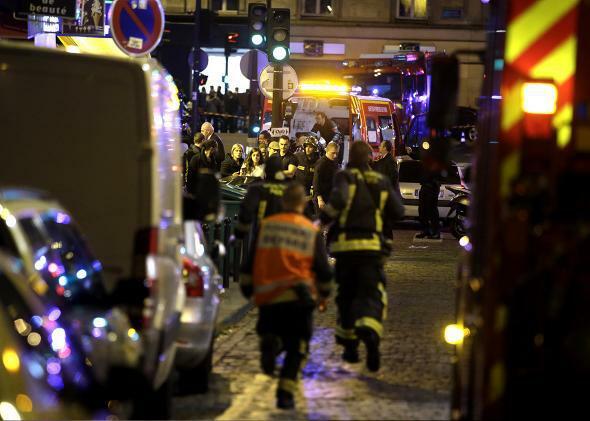 A Paris prosecutor told reporters that he believes five attackers may have been killed. Update, 8:10 p.m.: Reported estimates of the death toll in tonight’s attacks now range from 120 to over 150. The French Cabinet has also just announced what amounts to martial law in the Île-de-France region that constitutes Paris and the region surrounding—1,500 additional troops have been deployed to the area while authorities have given themselves the power to order the closure of public places such as concert halls and theaters, put individuals under house arrest, and confiscate weapons. Update, 7:30 p.m.: Police say at least 100 people have been killed in the Bataclan theater alone and at least two hostage-takers at that site are dead. French President François Hollande is reportedly en route to the theater. Update, 7:05 p.m.: Multiple outlets are reporting that the remaining hostages at the Bataclan theater have been freed in a police raid during which at least one hostage-taker died. Update, 6:50 p.m.: Reports indicate that shots were also fired tonight at 90 Rue de Charonne in the 11th arrondissement. A total of four shooting sites have been reported: 1) the Le Carillon bar and nearby Petite Cambodge restaurant; 2) the Bataclan theater; 3) the Les Halles shopping center; 4) on Rue de Charonne. Update, 6:25 p.m.: Several outlets are reporting that at least 60 people have been killed; the hostage situation at the Bataclan theater is still ongoing. Update, 6:00 p.m.: French President François Hollande announced in a brief televised statement that France is closing its borders to prevent the escape of individuals responsible for tonight’s attacks. Update, 5:55 p.m.: The French publication Libération reports that at least 42 people have been killed and that small groups are being evacuated from the Bataclan hall. Update, 5:45 p.m.: Multiple outlets are reporting that there has also been gunfire in the Les Halles shopping mall in the First arrondissement. Original post, 4:48 p.m.: Several apparent terror attacks—shootings in at least two locations and multiple explosions near a soccer stadium—have been reported in Paris. The AP, citing police, reports that at least 35 people have been killed. There have no reports that any suspects have been apprehended or killed. 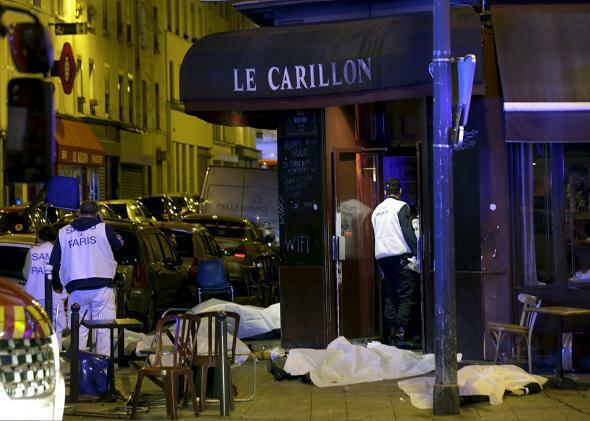 The BBC and the French publication Libération report that gunmen opened fire near the Le Carillon bar and Cambodge restaurant in the 10th arrondissement; gunfire has also been reported in the area of the Bataclan theater in the 11th arrondissement, where police reportedly say that hostages have been taken. (The AP says approximately 100 people have been taken hostage.) A concert by the band Eagles of Death Metal was scheduled for the theater tonight. The explosions are said to have taken place near the Stade de France, a soccer stadium where France and Germany were playing an exhibition game. The New York Times reports that French President François Hollande was attending the game and was evacuated, though the game continued even after reports of the attacks.